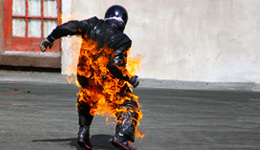 At Cunningham Law our experience as successful burn injury lawyers has taught us many things over the years, not least that burn injuries are frighteningly common. When you add the fact that burns are among the most painful and devastating injuries that people suffer… and most likely survive… you’ll understand why organizations like the American Burn Association (ABA) exist to educate and inform. Source: American Burn Association 2007 Burn Incidence and Treatment Fact Sheet. The experienced attorneys at Cunningham Law have handled numerous burn related cases across the country over the last fifteen years and have developed an expertise in this area. Take a look at our case summaries and you will see that we are experienced at handling all types of burn related cases, including thermal, chemical, scald, and electrical burn injuries. Our contingency fee basis means that clients owe no fee unless we obtain a recovery for them, so contact us today to arrange your free consultation. Statements on Cunninghamlawfirm.com are not meant as legal or medical advice. Consult with your health care provider for diagnosis or treatment. Since 2000 the Cunningham Law Firm has obtained compensation on behalf of our clients either through settlement or jury verdicts totaling $210,000,000. The personal injury lawyers at Cunningham Law are experienced burn injury and gas explosion attorneys and have represented burn injury and gas explosion survivors across the United States. We can represent burn injury and gas explosion survivors in all cities across the country, including but not limited to burn injuries in New York, Los Angeles, Chicago, Houston, Phoenix, Philadelphia, San Antonio, San Diego, San Francisco, Dallas, Detroit, San Francisco, Jacksonville, Indianapolis, Austin, Columbus, Charlotte, Memphis, Boston, Baltimore, Seattle, Denver, Nashville, Milwaukee, Washington DC, Las Vegas, Louisville, and Portland.